What the hell was I thinkin’, bro? BoJack Horseman is no stranger to the art of the flashback. 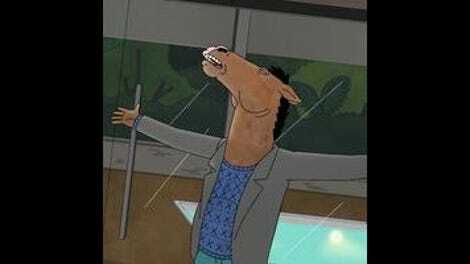 It’s used plenty of them in its first two seasons to fill in the gaps of BoJack’s history, showing us the key phases of his life: the lonely young foal caught between two loveless parents, the aspiring actor worried if he was ever going to make it in show business, and the hugely successful Horsin’ Around star gradually eroded by the spotlight and the substance abuse that came along with it. Raphael Bob-Waksberg and his writing staff know the value of introducing a circumstance, getting the audience to ask questions about how we got there, and then showing us—typically also breaking our hearts in the process. So it’s not surprising that season three of BoJack Horseman would decide to have a full flashback episode. However, there are two major surprises that come with said decision. The first is that they decided to place it so early in the season’s run, barely settling in before jumping into the past. The second is the comparably short time they jump, going back less than a decade to the halcyon days of 2007. While I’m unsure if the first choice works for the story—we’ve only known about the existence of The BoJack Horseman Show for a couple of episodes now—the second choice pays off in a surprising way. The world and characters aren’t all that different from what we know now, but that doesn’t mean we can’t learn something new about how they got to their current points. It’s the differences in the world where “The BoJack Horseman Show” truly shines. The BoJack creative team is fully aware that its audience has far fresher memories of 2007 than they do of the 1980s and 1990s, and the show’s already dense visual comedy becomes even denser as a result. References to catchphrases and individuals are are everywhere: billboards that say “Don’t Tase Me, Fro-Yo!”, mortgage companies that promise everything is going to be fine, skywriting that encourages everyone to watch John From Cincinnati (and whose tune changes only two months later). They’re obvious jokes, but these are also jokes tailored to the BoJack audience who lived through this time, an audience that loves the reference hunt. The spoken references are a mixed bag in terms of calling attention to themselves. None of the characters stand up and proclaim “It’s 2007!” in an obnoxious voice, but they come close: BoJack talking about upcoming iPhone releases and his new HD-DVD player, Princess Carolyn quoting There Will Be Blood months before the film is released, Todd’s girlfriend Emily practicing kissing with a picture of Adam Brody. I suspect—again—most of the audience will enjoy the references enough that it’ll carry them through the episode, and they’re never gratuitous enough to take you out of the experience. The real successes are the ones that become cruel jokes thanks to the benefit of hindsight: Mr. Peanutbutter referencing a “very strange offer” made to him by Michael Vick, and later MCing at a John Edwards fundraiser where a volunteer couldn’t stop talking about how the candidate had “touched” her. What makes the time jump such a curious decision at first is that by going back less than ten years, it doesn’t seem like we’re covering a lot of new ground. The BoJack of 2007 bears a strong resemblance to the BoJack we met back in the first episodes, a wealthy has-been star content to drink away his residuals and with no desire to go out and find any work. However, as we get deeper in the differences become more apparent. When he’s finally jarred into trying out a TV pilot from hamster Krill And Grace veteran Cuddlywhiskers, it’s not because he wants the money or the fame, it’s the lure of not being “The Horse from Horsin’ Around” anymore. His rut at the beginning of BoJack Horseman was one that seemed absolute, but his rut here comes across as less about drunken apathy as it does trying to preserve the status quo. Two episodes in, it looks like a recurring theme of BoJack Horseman season three will be BoJack’s ambivalence about the show that’s defined his career. The premiere saw him challenge the interviewers who tried to call it a terrible show, and now the possibility of eclipsing it sends him on a manic spiral. He and Cuddlywhiskers stay up all night to twist the pilot into something beyond the pale of network TV, something so gritty Denis Leary would turn it down, a show that opens with an “anti-catchphrase,” and a scene where he literally shits on his previous career. Is this a buried fear of further success that’s leading him to sabotage the project as badly as he’d go on to sabotage Todd’s rock opera, or is it a genuine desire to do something that will forever remove Horsin’ Around from the public memory? We don’t know, and it’s a certainty that if asked BoJack wouldn’t be able to say either. BoJack’s introduction to this show comes through Princess Carolyn, and “The BoJack Horseman Show” also gives us her origin story as we see how she became an agent after 14 years working under the geriatric lech Marv. This section winds up being the clunkiest of the past sequences, as Marv’s resignation is entirely too abrupt and his speech entirely too on the nose as to why being an agent won’t make anyone happy, and it’s brushed aside by a Princess Carolyn who’s thrilled with the chance to have her Mary Tyler Moore moment. However, it’s also a result that fits with the Princess Carolyn we’ve come to know, someone who can be complacent in less than ideal circumstances yet capable of bursts of great self-reliance once jarred out of said complacency. The other major origin story we get to witness is the meet-cute of Diane and Mr. Peanutbutter, which begins while she’s a barista calling herself “Blarn” and he’s happily in his second marriage to Jessica Biel. (Tip of the hat to real-life Jessica Biel, who puts up with all manner of digs at her career and puns on her name with grace, and according to Bob-Waksberg pushed them to go even further.) Seeing both characters in new circumstances makes it perfectly clear why they’d come together in the first place. Diane’s idealism floats over the ultra-irony practiced by fellow service industry twenty-somethings (a returning Wyatt Cenac and Fielding Edlow), and someone who’d encourage those aspirations is a breath of fresh air. Similarly, her praise for Mr. Peanutbutter’s enthusiasm for the most trivial gigs is something he needs more than he knows. It reminds us these two do complement each other, and makes us hope they work things out in present day. 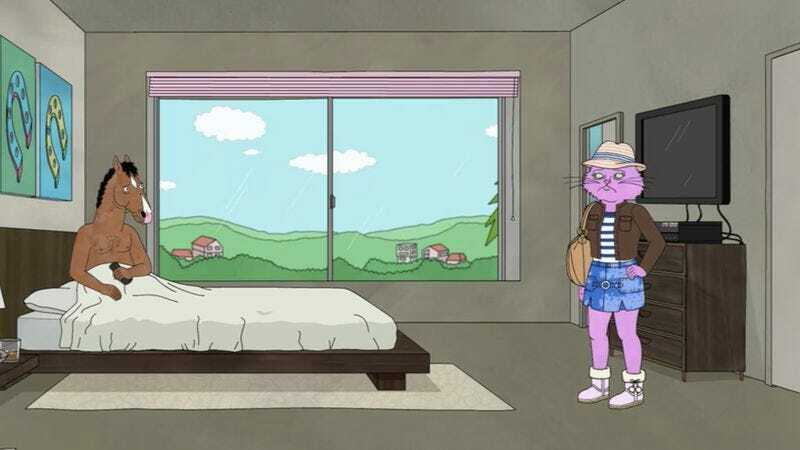 The real spine of “The BoJack Horseman Show,” and the one arc that justifies this jump in time as opposed to more time on the Secretariat campaign trail, is the time that it gives to BoJack and Princess Carolyn’s relationship. We’ve known since the first episode that they’ve been on-again/off-again for years, and knowing what we know seeing the start of this relationship is painful. Witness how kind BoJack can be to give her a gift for pushing him to take this chance—a box with crinkled tissue paper, how did he know?—and then how cruel he can be once she’s standing in the way of his reawakened energies. And then the final moment pre-premiere when Princess Carolyn calls off their relationship because she doesn’t them to keep doing this for years is the ultimate gut punch. They don’t think they’re going to keep this codependent and often toxic connection alive, but we as the audience certainly do. It’s emotional payoffs like these that keep the “The BoJack Horseman Show” in the upper tier of BoJack Horseman episodes. While it doesn’t hit the same heights as some of the show’s prior flashback ventures, it does something interesting by placing it so close to BoJack’s recent Secretariat upswing. We’re heading into what is ostensibly BoJack’s next big effort to reinvent his career, at the same time we’re seeing the last time he tried to do that—an effort that’s scarcely been mentioned before this point. Given the parallels, it remains to be seen if Secretariat will go a similar footnote direction. Once again, a friendly reminder to leave spoilers out of the comments. The episode might be set nine years in the past, but that’s no excuse. Best “Hey, It’s 2007” Gag: This one-time award goes to the best of the 2007 reference jokes in Mr. Peanutbutter’s work for a “blockbuster” original series. “They put the whole series on six DVDs, and then people go to their local Blockbuster Video to rent one disc at a time! For five days each!” As someone who watched the first four seasons of The Sopranos this way, this one stuck with me. It’s only for a brief moment as a non-speaking attendee at The BoJack Horseman Show’s series premiere party, but any sighting of Character Actress Margo Martindale is cause for celebration. BoJack has figured LOST out midway through its run. “So the island’s purgatory, right?” Jorge Garcia (another party attendee, and voicing himself) doesn’t get a chance to clarify.